The school relies on the generosity of donors to maintain its programs of excellence in academics, fine arts, athletics, STEM program and to provide faith-strengthening and character-building experiences. We invite you to join us in our mission to provide our students with a holistic, life-changing education! Raise funds for financial aid as well as meet the priority funding needs of the school. Foster long-term relationships with alumni and provide them with relevant and engaging experiences. Build a strong sense of community through events and partnerships. Manage the school’s overall fundraising, marketing communications, public relations, and new student recruitment in partnership with the Director of Admissions. Implement initiatives to accomplish the goals outlined in the Mission Statement, the Strategic Plan and the Advancement Plan of the school. Every donor matters, every gift matters! Salpointe is most grateful to its generous and loyal donors. 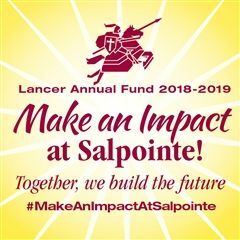 For information on making a donation to Salpointe, to leave a legacy through a planned gift, or to participate in the Arizona Tax Credit, please contact Jennifer Harris at 520-547-1952. All donations are fully tax deductible to the extent allowed by law. Gifts may be made anonymously, in honor or memory or in recognition of the donor. As a 501c3 organization, Salpointe has the obligation per the Internal Revenue Service to issue letters of tax deductibility for gifts received. All donors are recognized in Salpointe’s annual report and online commensurate with their gifts and with respect to their wishes. Designated gifts and donations to specific campaigns and funds are recognized around the school as appropriate.